Posted on 26, November 2018 by EuropaWire PR Editors | This entry was posted in Germany, Healthcare, Pharma & Biotech, Science, Technology and tagged affordable skin cancer therapy, basal cell carcinoma, Basal Cell Carcinomas, Cancer, carcinomas, epidermal radioisotope therapies, epidermal radioisotope therapy, Garching n. Munich, Martin Magwaza, NMSC, non-invasive, Non-Melanocytic Skin Cancer, non-melanoma skin cancers, nuclear medicine, OncoBeta® GmbH, painless, painless non-invasive skin cancer treatment, painless skin cancer treatment, physician, Prof Mike Sathekge, radioisotope, radioisotope Rhenium-188, radionuclide therapy technology, Rehnium, Rehnium-SCT, Rhenium-188, Rhenium-SCT, Shannon D. Brown III, single-session, skin cancer, South Africa, Squamous cell Carcinoma, Squamous Cell Carcinomas, Steve Biko Academic Hospital, Steve Biko Academic Hospital Nuclear Medical, Tautomer (PTY) LTD, University of Pretoria. Bookmark the permalink. Garching n. Munich, Germany, 26-Nov-2018 — /EuropaWire/ — OncoBeta® GmbH, a commercial stage Medical Device Company specialized in innovative epidermal radioisotope therapies for Non-Melanocytic Skin Cancers (NMSCs), announced today that Prof. Mike Sathekge from the University of Pretoria, Steve Biko Academic Hospital Nuclear Medical department and his clinical team has treated the first non-melanocytic skin cancer patients in South Africa with the innovative Rhenium-SCT® skin cancer treatment System. 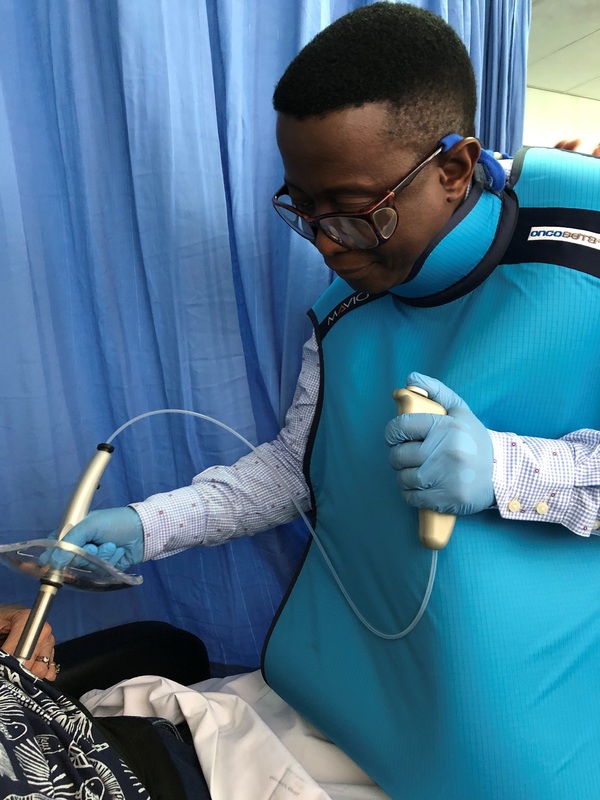 This next-generation radionuclide therapy technology applied by the nuclear medicine physician offers a new singles session, painless treatment for patients suffering from Basal Cell – and Squamous Cell Carcinomas (BCCs and SCCs).